Michael Leighton | 4/6/2016, 4:18 p.m.
Norman Sylvester and his daughter Lenanne-Sylvester-Miller will front the ‘Healing the Health Care Blues’ Inner City Blues Festival along with other top blues, R&B and soul artists in an April 16 concert to advocate for universal, publicly funded health care. A Portland blues festival historically rooted in civil rights and social justice causes is once again putting its focus on supporting a campaign to bring universal health coverage to everyone. The 5th annual Inner City Blues Festival, “Healing the Health Care Blues,” will be held Saturday, April 16 at the North Portland Eagles Lodge, with profits from the show supporting Health Care for All Oregon, a statewide coalition of 120 organizations and over 15,000 people advocating for universal, publicly funded health care. 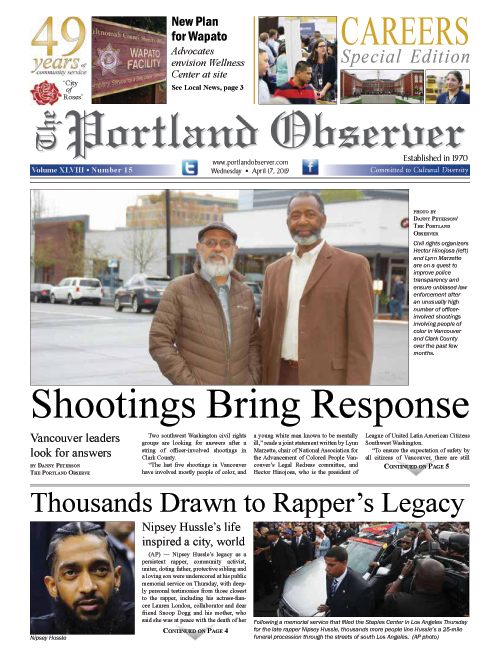 Portland blues, R&B and soul legend Norman Sylvester, a major backer of the cause and one of the performers for the show, describes how people are suffering because the system of health insurance still leaves many people out. This year in Oregon, an estimated 300,000 people still lack access to health insurance even under the Affordable Care Act, also dubbed “Obamacare,” a program that pays health insurance subsidies based on income, but can carry high monthly charges and big deductibles for many. The diverse lineup of participating artists is a stellar showcase of some of the best talent in Portland. Two stages of entertainment will include the Norman Sylvester Band, Terry Robb and Marilyn Keller, the Bloco Alegria Dancers and Drum troupe, LaRhonda Steele, Shoehorn and the Mad as Hell Doctors, Northwest Women in Blues and more. Progressive radio host Carl Wolfson will briefly explain how the U.S. healthcare system has failed us and how to make a change. Paul Knauls and Renee Mitchell, leaders of Portland’s African American community, will also participate. What is universal or “single-payer” healthcare? Simply put, it is Medicare for all Americans from birth to their final days. It would eliminate the Affordable Care Act, Medicaid, CHIP, and private medical insurance. Proponents say under this system 95 percent of American households would come out financially ahead. Patients would go to the doctor or hospital of their choice. “Single payer would make such a difference in everyone’s life, especially our local musicians,” said Donna Richards, one of the organizers of the event. The cause has extra meaning for musicians who as a group have gone without health insurance more than most and which as a profession has not benefited from a growing economy. Clubs have closed for various reasons over the years and the pay is even lower than it was 30 years ago, the musicians lament. A tight group that loves to support each other, they hold regular fundraisers for players that are ill. But even a successful fundraiser can’t make much of a difference. Costs of medicine and procedures have skyrocketed. People that are self-employed can’t buy policies way out of their price range. That’s why over the last five years, band leader Norman Sylvester and his wife Paula have worked hard to book entertainment for this popular event. Last year the festival pulled in 750 people. The goal this year is to raise $40,000.